I love the simple utilitarian packaging design of certain hardware elements. 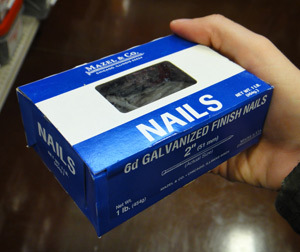 The one-color Mazel & Co. nail box shown above is a great example. It doesn’t try to speak beyond its means. It’s a box of nails pure and simple. There’s no need for overly splashy graphics. These nails work and the design reflects that. It’s a beautiful design. Nails shown above available for purchase at Fox Home Center, Alsip, IL. Mazel & Co. is located in Chicago, IL. how so? I’m not familiar with the show.